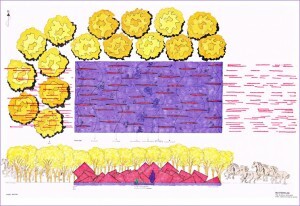 The concept:This installation was first proposed for a garden show and now has been redesigned and proposed for the Inhotin Sculptural Park in Brazil. The concept is horses that comes from the wild to a garden space, in this case a water garden. The horses entering the space become a corten steel sculpture and have different shapes to create an idea of movement around the garden. Part of the water garden have winding paths made of black cobbles on the surface level so that viewers can walk on bare feet to appreciate the sculptures. The horses bring a message from the wild, calling to come back to nature and to a natural state.